Wednesday night: Mostly cloudy & windy. Upper 20s to low 30s. Thursday: Varying sun & clouds. Windy and chilly. Mid & upper 30s. Friday: Bright, less wind, but very cold. Only in the upper 20s. 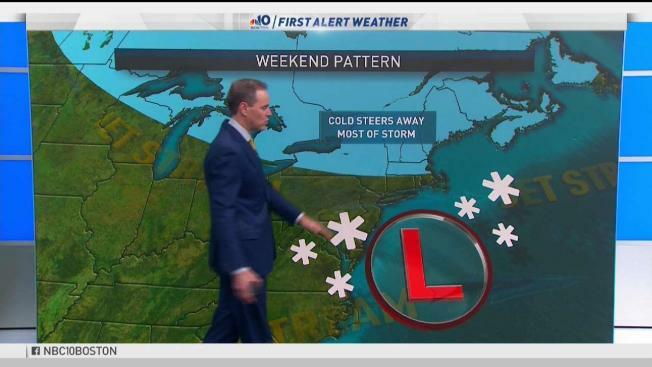 It ended up being a snowy day across New England. Some of the high peaks received more than a half foot of snow. Winds were also gusty with the highest gusts topping 40 mph. Our weather will begin to settle down overnight. Thursday will be colder with high temperatures ranging from the low to mid-30s. Winds will pick up once again with gusts between 30 and 40 mph. Wind chills will stay in the teens for much of the day. A few snow showers are possible with another cold front. Friday through Sunday will be mainly quiet, but cold. We are expecting some of the coldest air so far this season. A string of 3 days with temperatures staying in the 20s is possible. The last time Boston experienced back to back days in the 20s was last year on Jan. 14 and 15. All eyes are on a coastal storm for Sunday. Right now, it does not appear that accumulating snow will push into southern New England. It's possible that we could see some flurries, but accumulation chances are very low. Currently, no large storms are on the horizon. As we go from the weekend into next week, temperatures will gradually moderate.